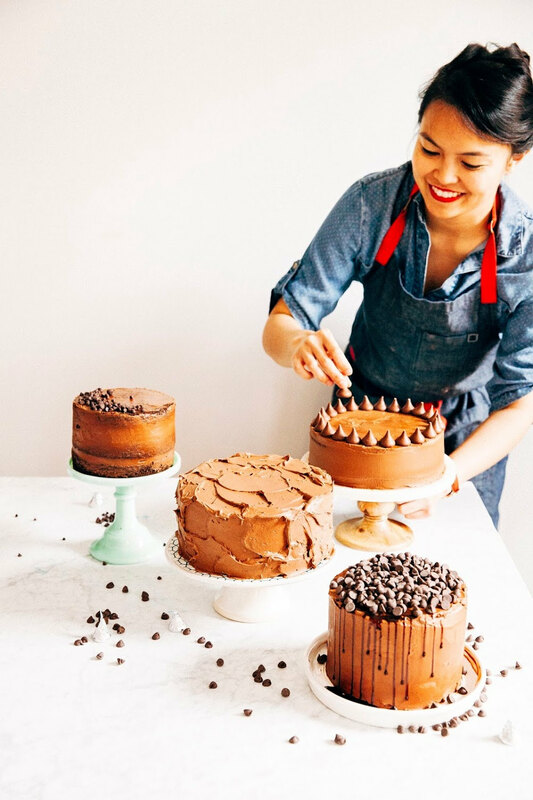 I noticed the other day that I have a LOT of chocolate recipes on my blog. My last two posts -- my marble pinwheel cake and double chocolate cookies -- have been chocolate related. I think it's about time for something new. What's a quintessential baked good that doesn't involve chocolate or vanilla? Lemon bars tend to be a hit-or-miss for me. 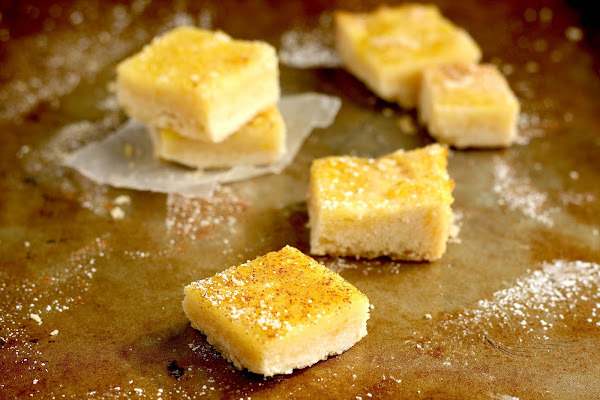 Although I love citrus-flavored baked goods (as made evident by the abundance of lemon- or orange- scented baked goods in my recipe index), I tend to be wary towards lemon bars. Often times they are too sweet, with copious amounts of sugar overtaking the lemon flavor. These bars have all the elements of a lemon bar that I really enjoy: lemony, tangy, gooey, and not too sweet. I think I like these a lot because they are actually more shortbread cookies with a lemon topping? For instance, I'd say that the cookies are actually 3/4 lemon shortbread and 1/4 lemon custard. The perfect ratio. Don't forget to top off with a sprinkling of powdered sugar, cinnamon, and ground ginger to give these babies a unique flavor. 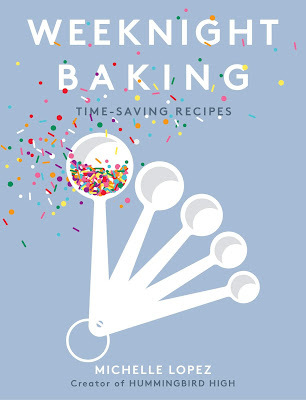 Put 2 1/4 cups all-purpose flour, 2/3 cups confectioners’ sugar, pinch of salt, 2 sticks unsalted butter, and 2 teaspoons grated lemon zest in the bowl of a freestanding electric mixer with a paddle attachment (or use a handheld whisk) and beat until the mixture resembles bread crumbs. Press the dough together with your hands, then use the back of your hands or a spoon to press it evenly into the base of a 13 x 9” baking pan lined with parchment paper. Bake in the preheated oven for about 20 minutes, or until light golden. Place on a cooling rack to let cool slightly, but leave the oven on. Put 1 cup sugar, 3 eggs, 6 tablespoons lemon juice, and 3 teaspoons lemon zest in a medium bowl and whisk until well mixed. Pour carefully over the slightly cooled baked crust and return to the oven (heated to 325 (F)). Don’t worry if it looks too runny -- trust the recipe! 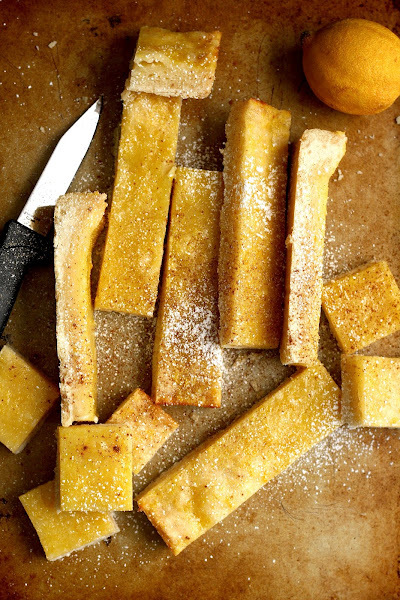 Bake for 20 minutes, or until the edges are golden brown and the lemon topping has set. Let cool on a cooling rack completely, before covering and refrigerating overnight. 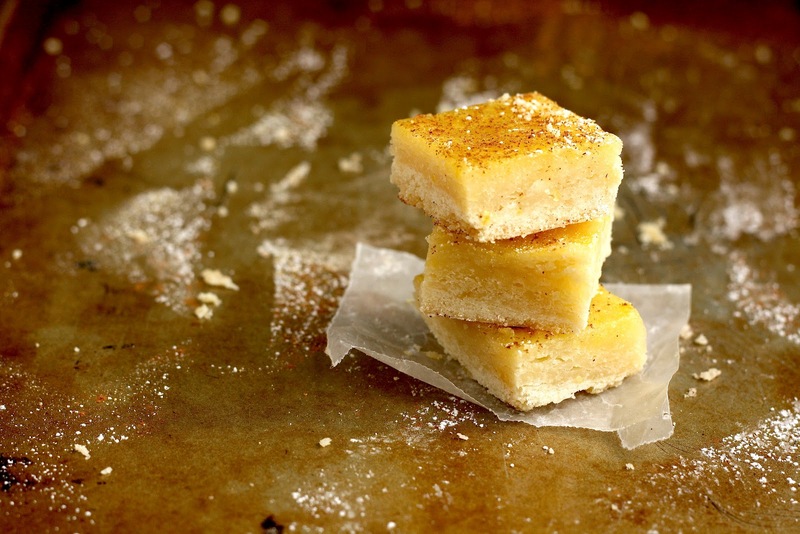 Once the lemon topping has set, slice the into small squares or long rectangles while the bars are still chilled. 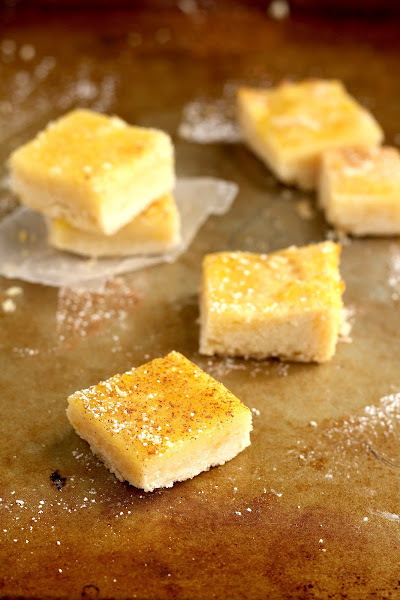 In a small bowl, combine 1 teaspoon confectioners’ sugar, ¼ teaspoon ground cinnamon, and ¼ teaspoon ground ginger before sprinkling evenly over the lemon bars. Let thaw for 20-30 minutes at room temperature before serving. Absolutely beautiful! Most lemon bars look so neon. These look a bit more natural and wonderful.